I went up to a neighbors today and helped work some calves and cows with their fall shots. Fun and pretty nice weather to work in. Beaver did pretty good sorting. I was a little heavy on his head at times when I’d forget to ride with my legs, but he will duck and dive a little, when encouraged to do so. I wore the new contacts all day today. Made reading weird. Hard to get the words to all focus. I may have to go with regular ones and just wear reading glasses, instead of these with the bi-focals built in them. Just for looking around, I like them. I have periphrial vision again! I will wear my glasses the next few days at the poetry rodeo and gathering. When I get back, I will start in again with the contacts. Well, I set here writing this a changed man. I got contacts today! Guess that is good enough for the first anniversary of this blog. I was needing to get my eyes vhecked and had visitied with a neighbor lady who wore these soft contacts for years. She since has had Lasic surgery and commented that she missed her contacts for keeping dirt out of her eyes. That was the main reason I had never tried them before. My eyes had changed a little and I hate wearing glases, for all the usual reasons, so I hope these work. Pop them in and leave them in for a month and then pop a new set in. About the same cost as my glasses, maybe a little cheaper. I won’t have to worry about them fogging up, or sweat running off my face into them or them getting dirty. So I guess old dogs can try new tricks. We’ll see how it goes. Here’s Dean pitching one at the hind end while Case holds the front end. I thought if I made it sepia toned maybe the ropes would show up better. Just got done with a new poem and decided to put it on here. Let me know what you think. I sent it of to my mentor and she made a good suggestion. I goes a lot smoother now. Thanks Beth. As always, read it out loud for the best effect. This comes from a true account in a book by a Mr Cook who lived on the frontier and came up the trail, guided hunters and the Army. Not a braggart at all, just true accounts of the life he led. I thought the story was entertaining and had never heard of anything like this happening so decided to make it into a poem. why they had been looking for me! I was ridin’ to save my hair! Here’s a picture of Case, the young man’s father from yesterday’s blog entry. A good man, neighbor and friend. He’s got a steer coming at him and fixin’ to stick one on him. Got a good intro to a story he wrote several years ago and a link to read it. Interesting. He’s a hell of a writer and I always tease him about writing the great American novel. He could do it and I think will, after it has distilled in his mind long enough. Right now he has a lot on his plate. But he is still a hell of a writer. 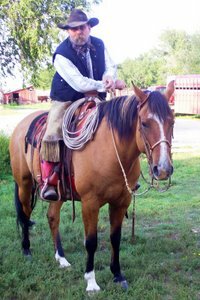 I am going to be heading out for Hot Springs in a few days for the Poetry Gathering and Cowboy Poetry rodeo. I am one of the judges for this years event. This is the first time it will be held in Hot Springs. Quite the deal, a bunch of poets competeing and being judged just like at a regular rodeo for money and honor. Got a couple night shows with some big name talent on friday and saturday night with jam sessions ans poetry sessions both all day friday and saturday. Anyone who is even within several hundred miles should attend as this is a lot of fun! Here’s Case and Bubba, gettin’ one trapped so they can throw a loop at him. What do you think of this pony Mad? One of the neighbors. A nice young man who started this colt and just worked with him a little bit at a time. Colt is a 2 year old and he was roping steers off him last evening. We were ranch roping, so it wasn’t like he was running him all over and roping the cattle and jerking them and his colt around. Just real easy stuff. Lots of standing. I’ll post more pictures of our roping as we go along. I tried to load some pictures last night, but couldn’t get this blog to accept them. Chance on Frankie, spring of 06. Don’t think I ever posted this on here yet. Guess it will have to do for now Pixie. I took 3 horses to my colt man today and then stuck around and helped him put some siding up on his house. He had a bad hail storm come thru’ and he’s still getting things re-built. Two horses for him to ride for a bit and one I am giving him. She’s a nice filly that goes back to a mare he had. She also goes back to Kid and he’s got a half brother to Beaver, out of Kid and wished he had another, so with the prices of horses what they are, especiially fillies, I just told him he could have her. I felt better about it than what the money would have made me feel, if I had sold her. He can always bring her over to my stud, if he wants, also. Taaaaa Daaaa (or what ever would sound like a drumroll! If you haven’t noticed, there are a few changes to the looks of this blog/journal! There may be more coming your way. In the future you may see some ads on here. They are for your benefit. Let me know what you think, if you like the changes or not. As I was going through my poems and re-printing some (seems I lost the ones I had printed out) I came across this one. Ray Hunt, who is a wonderful trainer of people and an advocate of horses (do a google search) has quoted this in the past as his clinics. I thought it was very apt and very true. Wish I knew who wrote it, other than anonymous, who seems to get lots of credit for lots of printed material, all of which he/she couldn’t have possibly written! A friend who also builds saddles and can really throw a rawhide riata and hit his targets, was kind enough to give me a copy. Thanks Don! I try to live by this quite a bit, tho’ I have been accused of being selfish. I just figure if I ain’t happy with who I am and what I am doing, I won’t have much time to try and help others, whether they need me to or not. I’ll try and come up with some fresh horse pictures Mad, but I’m running out of fresh material! Not only a horse picture but an old, bearded, fat man too! With aa almost 1 year old pup, who’s got the makings of a fine cowdog, tho’ he ain’t quick enough to catch a dumb ol’ jackrabbit! We three, and Nip also (who didn’t make the picture) had been out moving some horses around and checking on grass for yearling. We were ambling back towards the house, when bang! A dumb bunny jumped out of the grass right underneath Shadow’s nose. Poor dumb puppy, didn’t stand a chance, tho he gave the rabbit quite a go for a little ways. Any dog who can’t catch a rabbit that close, is never going to get a better chance! Oh well, he had his fun trying to catch him and like so many of us, maybe if we caught what we were chasing, we just wouldn’t be satisfied! By the way, this blog is coming up on it’s first annivarsery, on Sept 24th. Anyone who can come up with a good contest and prize idea for a small celabration, just let me know.